1. Place 3-4 spoons in freezer to chill. These will be used to test the doneness of jam later. 2. In a large, heavy bottom pan, add strawberries, sugar, salt, lemon rind and lemon juice together to cook on slow flame. Allow it to cook on slow bringing it to boil. To reach a chunky consistency, you may need to mash the strawberries lightly using a potato masher. Alternatively you can use pureed strawberries in place of mashed if you do not like chunks in your jam. 3. Continue to stir as the jam thickens and reduces. The bubbles which will form upon cooking, will also start to reduce in size and become thicker. This should take from 10 - 30 minutes depending upon the size of flame. For me it took me 25-30 minutes to reach as I cooked it entirely on slow flame. 4. Bring out one of the chilled spoon and place a few drops of jam on it, and wait for few seconds. Run a finger through the blob of jam, and if it makes a clear path and doesn't come back, the jam is cooked. If it comes back, then cook the jam for another few minutes and repeat the check with a fresh chilled spoon. 5. To sterilize the Jar: Wash the jars and preheat the oven to 160°C. Keep the jars in oven for about 20 minutes. Pour hot jam in hot jars. Do Not pour hot in cold jars. The glass will shatter. Seal jars when they both reach room temperature. It will stay refrigerated for 4-5 weeks. You can take bubbles as a clue to doneness. When the jam first starts to cook, the bubbles are larger and thin. As the water starts to evaporate and the jam starts to thicken, the bubbles become smaller and tighter. Also, you can’t ‘stir the bubbles down.’ Which means, when you stir the jam, it still stays in a full boil. When this happens, it’s good to bring out the frozen spoon and start checking. 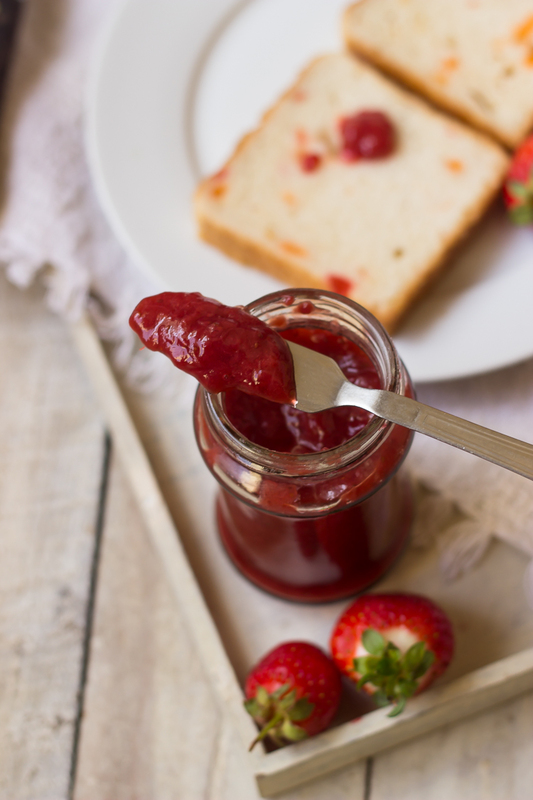 You can use the same process for other berries and fruits that you make jam with.